Alphonse Legros (1837-1911) was born in Dijon where he entered the Ecole des Beaux Arts before attending the 'Petite Ecole' of Horace Lecoq de Boisbaudran (1802-1897) in Paris and then Ecole des Beaux-Arts. He started exhibited at the Salon in 1857. In 1863, Legros visited London where he found admirers and patrons, notably the Ionides family, and was ardently promoted by the brothers Dante Gabriel Rossetti and William Michael Rossetti. An etcher, a painter and a sculptor, he succeeded Edward John Poynter (1836-1919) at the Slade School in 1876 and was naturalized as a British citizen in 1880. This work is a fine example of Legros' portraits of scholars and artists of his time. The sitter is the surgeon John Marshall, who was professor of anatomy at the Royal Academy. He lectured on artistic anatomy and pioneered the teaching of physiology at University College, London, to mixed classes. This work was probably executed as one of Legros' famous timed head-studies, a method he developed while lecturing at the Slade School. 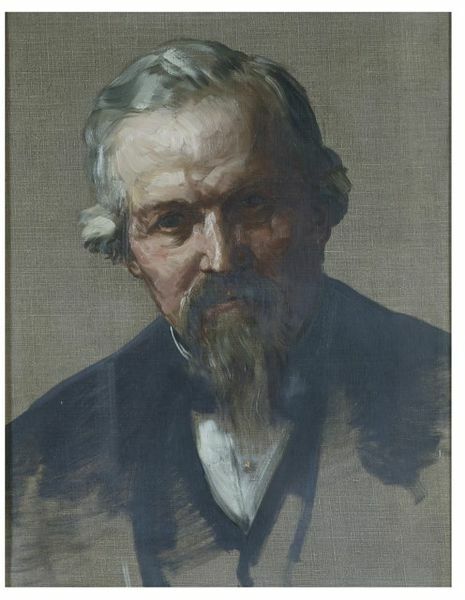 The artist gave this portrait to the Museum, probably to enrich its collections of educational materials as the museum included at the time a School of Design. 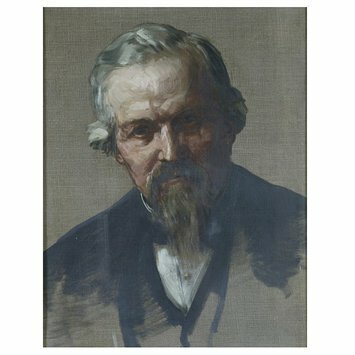 Face portrait of a man with grizzled hair, large forehead, dark eyes, and grizzled beard and moustache in an unfinished sketchy dark jacket with a white collar, silhouetted against a neutral greyish background. Historical significance: This painting is a fine example of Legros' portraits. It depicts the surgeon John Marshall (1818-1891) who may have been acquainted with Legros by the intermediary of Dante Gabriel Rossetti (1828-1882), one his patients and supporters. Rossetti belonged to the company of independent painters that welcomed Legros upon his arrival to London. 'On stated occasions a special model is ordered, and the professor, standing in the centre of the life school, paints a complete study-head before those students who are sufficiently advanced to be admitted to the life class. His method of work is simple in the extreme; the canvas is grounded with a tone similar to the wall of the room so that no background needs to be painted. […] In about an hour and a half, sometimes in less time, the study is completed, and the watchers have probably learned more in the course of that silent lesson than during three times the amount of verbal instruction.' (The Magazine of Art, vol. 6, 1883). This method founded the influential 'Slade tradition' of fine draughtsmanship. 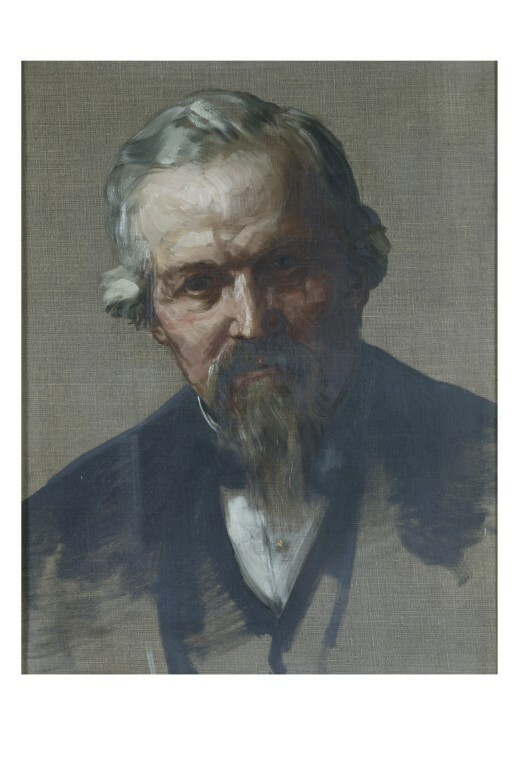 Legros did many oil sketches of this type, which were extensively copied by his pupils. This technique, although used for centuries by European artists, astonished the Victorians (MacDonald, 2004). However there are also a couple of critical accounts of the process: Camille Pissaro (1831-1903) but also Walter Richard Sickert (1860-1942), James McNeill Whistler (1834-1903) and John Ruskin (1819-1900) criticised among other things the 'entire absence of relation between the head and the background'. (Sickert, 1947, p. 239). Summary Catalogue of British Paintings, London: Victoria and Albert Museum, 1973, p. 80-81. W. Sickert, A free house! Or, The artist as craftsman, Osbert Sitwell ed., London, 1947, p. 239. W. Rothenstein, Men and memories, recollections, 1872-1938, vol. 1, London, 1978, p. 25. A. S. Hartrick, A painter's pilgrimage through fifty years, Cambridge, 1939, pp. 7-10. S. MacDonald, The History and Philosophy of Art Education, Cambridge, 2004, pp. 270-283, esp. 270-273. W. F. Bynum, 'Marshall, John (1818-1891)', Oxford Dictionary of National Biography, Oxford University Press, 2004 [http://www.oxforddnb.com/view/article/18145, accessed 25 Feb 2011].